That ever so oxymoronic beer style that we all love to hate, until we taste a good one. Whether the name is daft or not, the fact is that Black IPAs when done right are a great 'style' to drink. Hell call it a hoppy porter if it makes you feel better. Some of 'em taste great. But are these two up to scratch? As you would hope this pours black, well very, very dark brown when held to the light. The aroma is bitter chocolate, very intense resinous hop oils, and a little overripe banana. The flavour is really intense with bitter dark chocolate, fruity ristretto, spiced orange, oak aged rum, smokey roasted malt combined with a big bitterness making the aftertaste bone dry. Despite it only being 8.2% this one is verging on hoppy imperial stout territory. Pretty full on stuff. This is a great looking beer. A big pillowy off white head that sticks around and laces the glass (a feat in itself at this abv) and a thick black body with scarlet tinged edges. At this strength Black IPAs tend to slip into the hoppy imperial stout mould, as the Peak Organic almost did, but this one manages to bring hops to the fore just enough to keep things on track. Its got a big fruity aroma of red berry, citrus pith and pine and a flavour which is all at once citrus, cocoa powder, resinous pine, fresh leather, herbal pepperiness (perhaps like fresh oregano) and bitter chocolate. 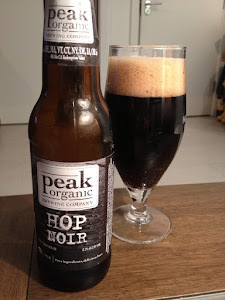 There's a lot going on but it's much less intense than the Peak Organic, in a good way. The flavours are clearer and it's more of what I would consider a true Black IPA. For the strength it's also unbelievably drinkable. 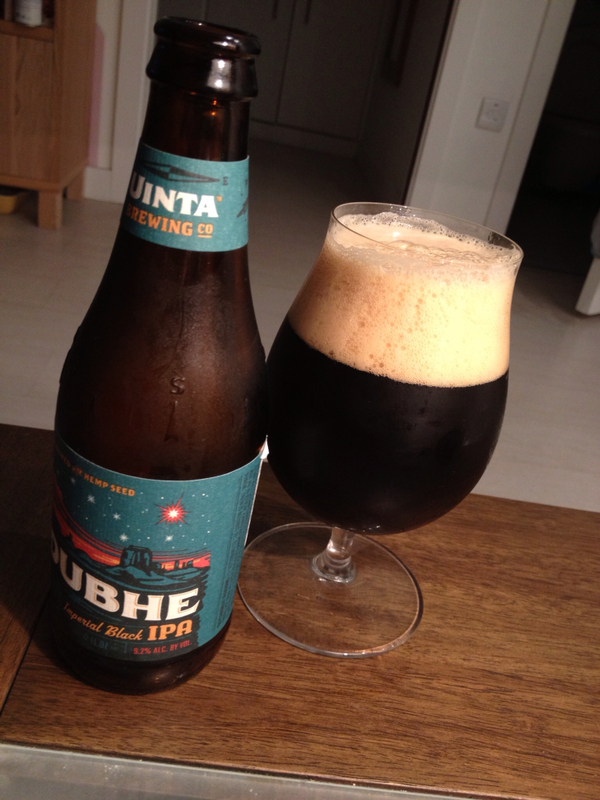 For me the Uinta just has the edge out of these two. Came across this blog whilst drinking a black bier myself - Köstritzer Schwarzbier.